This product was added in our store 12/9/2018 6:44:49 PM. 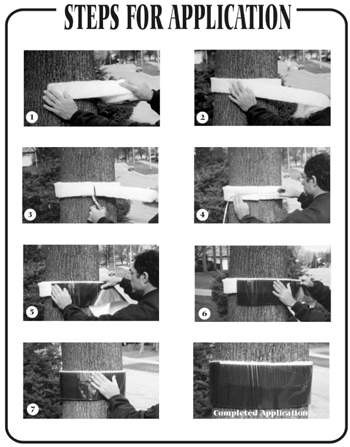 The BugBarrier Tree Band is a simple-to-install and non-poisonous approach to effectively trapping and killing a list of insects capable of defoliating full-grown trees. BugBarrier Tree Band works the entire season to catch canker worms, gypsy moths, ants or similar insects on a hidden, sticky surface that stops them from climbing trees. The product arrives in two rolls. The first is dense cotton under layer that fills crevices in the bark to detour passage above. The second roll is a sticky and wide band capable of retaining thousands of tree-killing pests during the season. Although most pest movements happen in the spring and fall, check with your local extension service to find out the correct season. Best of all, when your customer sees how effectively this product works, you can expect a call every season! BugBarrier Tree Band can be installed in 3-5 minutes and removed in about 30 seconds using the step by step instructions listed below. The only tools required are scissors or utility knife and, for deeply furrowed bark, a putty knife. Effective non-chemical barrier to climbing and crawling insects. Effective against bugs yet harmless to the touch. Doesn't stain bark of otherwise affect tree's health. Effective against spring and fall cankerworm, forest tent caterpillar larvae, gypsy moth larvae, ants and most other crawling insects. Wrap one layer of the 3" wide white fiber material around the tree circumference at DBH (diameter at breast height, approximately 4.5') so it clings to the bark. • Do not put tension on the material. • *Wrap a second layer on top of the first. For trees up to 24" in diameter, measure off enough green film barrier to go around the fiber barrier, and cut it. • For trees over 2' to 4' in diameter, add six more inches of overlap. Fill any gaps in the bark or trunk irregularities with fiber material by pinching small amounts from the roll and stuffing it into the gaps from the top. For gypsy moth, use our 5" wide Gypsy Moth Wrap to provide a ramp for the larvae to get down the tree so the band can stop them on their way back up. Start applying the Gypsy Moth Wrap at the upper edge of the BugBarrier Tree Band, making sure the wrap covers both the film and the fiber. Apply two wraps of the 5" material as you move upward from the band. The Gypsy Moth Wrap should be snug, but not so tight that it deforms the BugBarrier Tree Band. Cut the wrap and the end will cling to the barrier on its own.